Today we showcase an exciting and a successful venture co-founded in 2007 by Andrew Ballard from Drysdale on the Bellarine Peninsula in Victoria, My Perfect - Dont Search, Choose or in other words it turns the idea of a search engine completely around. We've developed a revolutionary new type of search engine - so different, in fact, that we've coined the phrase 'choice engine' to describe it. To go back one step - there's a fundamental problem with the way traditional search engines work. So fundamental, in fact, that everyone seems oblivious to the problem. Traditional search engines begin with a single query and return thousands or millions of results. These results are determined by a complex algorithm that takes into account relevance, straight keyword matching, user history, and a whole lot of 'secret sauce'. Users browse the results, scanning the pages for further clues or triggers until they find a satisfying result - and then they follow that link to a new web site. If the web site doesn't answer their query, they go back and try more links until they find what they're looking for. It's something we're all well familiar with. The problem is that the user on a traditional search engine is ultimately the one left to refine their own results, and most usually by trial and error of trying web sites that either are or aren't able to assist them in their query. Over time, people using search engines have grown used to typing more specific keywords, and adding geographic bounds to make the results more manageable. But even for power users, the refining the of the query - that is, finding the best information for the individual - is all left up to that user. Search engines are happy to provide results, but are simply not able to go the next level, and assist users in assessing whether the results truly *are* the best for the individual user - in short, search engines can only return information, not personalised assistance. My Perfect turns the idea of a search engine completely around: instead of starting with one query, and resulting in thousand or millions of products, we *start* with many thousands of items in any given product category, and play a very fast and intelligent game of '20 questions', until the user is left with just one, perfect product. 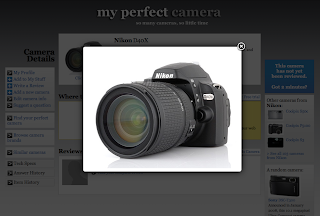 The questions posed are non-technical, and in a conversational style, so the user can quickly refine 1200 digital cameras, for instance, down to just a handful in only 5 questions. Our algorithm looks at what you've already answered and what items are still remaining, to determine which question to ask next, and therefore be able to split the pack as quickly as possible. The user can always choose to skip any question if not completely sure how to answer, so there are times when the pool of remaining items is more than one - but the big feature is that the whole choice engine is human-powered, so a user can help us frame a question that might be able to split the remaining items. Over time, the choice engine will grow to a stage where we will always be able to keep asking questions, until only your one perfect product remains. 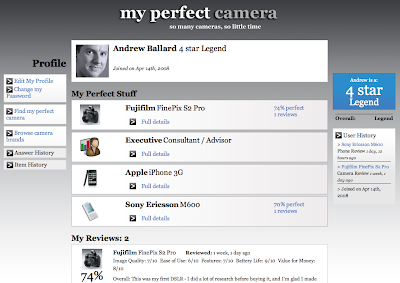 We launched My Perfect this month with the categories of My Perfect Beer, Camera, Career and Phone. Over the next 3 months, we'll be rolling out 12 more categories, and we currently have plans for well over 50 categories in 2009. We've found that everybody already knows how to play 20 questions - it's the ultimate long-distance-car-trip game - so once people see how their answers quickly reduce the pool of beers remaining, the concept is just the same for the other categories. Once we find a user's perfect product, we then show them reviews of that product, and direct them to online and bricks'n'mortar businesses where they can purchase that product, and do further research. It first formed early in 2007, when I began questioning the reliance we all have on traditional search engines. Don't get me wrong - I love Google as much as the next person: for finding facts, opinions and imagery, it's an awesome resource. But all too often, the top results of my searches were well optimised sites full of more links that promised me the right information, but didn't add anything apart from more trial and error clicking. For finding information, search engines are brilliant. For helping people make sense of that information, well, tough luck - there aren't any/many sites that can actively help people make informed decisions - without either a heavy bias towards a commercial pool of results, or without the user having to read an "Idiot's guide to..." book prior to visiting industry portals. Some early prototyping convinced me that playing the old game of 20 questions would be statistically simple, but very difficult algorithmically on the internet. I brought in James Rickard, and together we brainstormed how such a system might work and how it might look. The problem with being 'the first' of any kind is that there's no precedent, so simple choices like layout of the site, and the terminology we'd use, were all up for grabs. It was a similar problem I had when working as Creative Director on the Raine & Horne Real Estate site in 1999 - it was one of the first property listing sites on the web at that time, and the only precedent for 'saving' houses you looked at was by adding them to your shopping basket! For My Perfect, we spent most of early 2007 making revisions to the site architecture until the day the Federal Election was called: we quickly put together a beta version called myperfectparty.com.au, where we let users answers questions based on each parties' policies and watch graphs of the political parties rise and fall according to their responses. Feedback was overwhelming - literally - our initial rapid development platform couldn't stand the load of the 60,000 questions asked in a two week period - and so by 2008, we'd redeveloped the site using a leading open-source, highly scalable framework. In total, some 18 months: 6 months of rapid prototyping and an initial beta; 6 more months of rebuilding it in completely in a world-class framework for a multi-site approach; then 6 more months developing critical features and the back-end systems to manage the rollout of the range of sites to follow. Our aim is twofold: firstly, we want help consumers with their online product research and their online purchasing decisions. The choice engine is an 'expert in your pocket' for a consumer - a true expert system. Even more importantly, the choice engine is as unbiased as we can possibly make it - it relies on the cold, hard 'tech specs' of any given category to choose or discard products, and not opinions nor unfair judgments of merit. If there are any inconsistencies in the tech specs of a product, the users of the site can 'crowdsurf' the correct answer - so we can effectively use the collective brain of the user base to ensure the right outcomes over time. Our second objective is to provide businesses with a vastly superior standard of sales leads for their marketing dollar. With advertising clickthrough rates getting into fractions of a percent, and search engine marketing cost per clicks rising, but without corresponding rises in conversion rates, My Perfect aims to give businesses as high a qualified sales lead as possible. We're effectively doing the pre-sales work to determine which product a consumer should buy or consider buying, and then only linking to businesses who can directly fulfill that particular product. We're trying as hard to match a consumer with their perfect product, as we are trying hard to help businesses find their perfect customers. Any consumer somewhere in the 'purchasing cycle' of a product in the categories we offer. The 'purchasing cycle' is well known to all of us: we initially have little interest in a certain product category - a new car, for instance - but then over time, we being to consider an upgrade. We slowly get around to some initial research, and at some stage, we do some serious investigation into prices/models and reading reviews. Just before we commit to a purchase, we're actively following all leads, trying to find the best deal in town - and then, at the moment of purchase, our interest peaks... and then just as abruptly, after a purchase, our interest dives back to near zero. With this knowledge of the cycle of consumer research, we're aiming My Perfect at consumers everywhere on that path: from early snoopers, to avid researchers, to hot prospects - and even to consumers after their purchase - there are already a lot of people using the site to verify if they made the right decision after the fact! We're most effective for consumers with 'beginner' to 'intermediate' knowledge of the category they're looking for. The non-technical language throughout ensures that consumers don't need to know what the right terminology is - they just need to respond to the questions and pick the most appropriate answer. Experts are more than welcome on the site - but we have a higher purpose for them: we want to turn them into 'gurus'. By writing reviews and adding new items, users on the site can climb a social ranking system, where by they begin as 'novices', and end up as 'experts', 'gurus' or 'legends'. As users contribute more to the site, the weighting of their reviews goes up, so there is always a moderating factor to let experienced users guide newer ones. One fundamental truth about us as humans is that we're all experts in some things, but not in other things. So while one person may be an expert in wines, and can contribute back a few precious gems of knowledge into the system, they may not be an expert in TVs, and would be grateful for the collective wisdom of the experts in the TV category. We only launched our v1.0 in mid-August, and we purposefully soft-launched it to family/friends/forums to give it a real-life load test. As such, we're -ahem- not peaking our server load quite yet. In beta trials during the Federal Election in 2007, we had almost 10,000 visitors in the two weeks leading up to polling day, so if that's any indication of the attraction of the concept and given that we'll have 10 such sites running by Christmas, we'll soon have the beginnings of a great base of users, gurus and businesses. Word of mouth at this stage, but since we're so industry segmented, we'll hit the trade show scene next year to ensure good market penetration into both the consumers and businesses of one category at a time. We're currently doing a mini-pitching tour: three on the horizon in the next 7 days, so we're looking forward to a future where our marketing budget might not be limited by the size of our collective credit cards. Right now, we're capturing a lot of vital product metadata as our users visit the site. Of course, we use the standard setup as far as page views/analytics is concerned, but a whole raft of user-identity-free information is being captured about which products are on top of results, and which products are moving in different segments of an industry. Over time, we'll be able to package a sophisticated product analytics offering - not unlike the Hitwise model, but for actual product trends, not just for product *web site* trends. From a psychological point of view, we've noticed that the choice engine is quite revealing in the final perfect product you arrive at - the first time - but then on subsequent tries, many users try to 'outthink' the choice engine, to try to find a product they already have in mind. For instance, it's quite probable than many users on myperfectcar will use the choice engine without over-analysing the questions, and quite honestly end up with a Toyota Camry as their perfect car - functional, practical, and great value for money, just not earth-shatteringly exciting. We've then noticed that out test users desperately try to find the Porsches to 'prove' to their spouse that it really *is* their perfect car. Technically, all the categories of the site are their own sub-site: linked, but independent at this point. So financially, we'll be measuring the success of different industries against different yardsticks, given the breadth and depth of their respective markets. As an extreme example of this, we'll be aiming for at least 1 category in 10 to be community focused: myperfectpet will provide guidance of what type of animal might best suit you, and give free links to non-profit clubs and animal welfare shelters where you can find that type of pet. Myperfectsport will be aimed at helping people determine what would best suit their health/lifestyle needs, and will link off to the nearest club or association of their perfect sport for more information. Revenue will be generated from three sources: listing fees, product analytics, and a small measure of display advertising. Listing fees will be the primary driver of revenue, and we firmly believe we'll be providing excellent value in this area, due to our choice engine providing educated, perfectly qualified leads direct to businesses. We will announce a range of innovative product analytic offerings in 2009, that will give real-time insights into the trends and forecasts of different manufacturers, products and industries. This is groundbreaking stuff - My Perfect is a tool exclusively for consumers wanting to decide what products to buy in any one of our categories we offer - and by virtue of the fact that we go on to actively assist that consumer in narrowing their search, we can easily remove all personal user information, and aggregate the remaining data to uncover the thought processes of consumers in Australia. In a direct sense: none. Indirectly, though, we're playing against traditional search engines as either a competitor or as a companion site. We're also a counterpoint the major industry-specific portals in that they provide in depth coverage on any one given industry, but generally assume that their user base also has a corresponding in depth knowledge. For instance, when a consumer wants a new plasma TV, they don't always need to know all the ins and outs of the jargon nor do they want to have to read a new review per week until they find what they want - a large proportion of consumers just want to make a good decision, quickly, from all available choices. In a similar fashion to industry portals, comparison sites provide a great way to place a few items side by side to compare technical specifications - but the emphasis is on the consumer to choose the right products to compare side by side. Most often, consumers on comparison sites will compare only the brands they know best, when there may well be hidden gems of products that would suit them better. In contrast, the My Perfect choice engine includes all products in a given category, and only rules them out based on a consumers' needs, not on their brand awareness or lack thereof. It's pretty much LAMP, all the way. We love LAMP. The framework that holds our Apache, Mysql and PHP together is CakePHP (cakephp.org) - a MVC (model/view/controller) framework for PHP - essentially PHP's version of Ruby on Rails. It's fast, flexible, and the only drawback is the absolute conciseness of code: rather than get into trouble with managing 100,000 lines of code to power My Perfect, we have only about 2-3,000 lines of code. It's a very compact framework, so we often fall over each other working on the same files at the same time. The documentation of CakePHP is finally 'coming good' - it was a little sketchy there 12 months ago when we chose it as our primary framework, but the CakePHP community and the level of documentation have improved dramatically in recent months, so we feel we made the correct choice. Back end, we use my favourite rich-development application: Filemaker. It's one of the fastest ways to create business level logic, and keep it separated from the live server environment, where speed and brevity are paramount. That means that James and I have direct access to the live systems for analysis and admin functions, without adding an overhead to the live site or slowing it down at all. Read deeply and read widely - there are incredible resources out there for anyone dreaming about beginning something new. If you pick your gurus, and find out who *their* gurus are, you'll eventually be able to tap a collective brain that can help develop the practical aspects of your venture, as well as shape the ethos behind how you go about your venture. I haven't subscribed to a newspaper nor a magazine for about 10 years, but each morning, I read/scan/absorb over 200 blogs by following their newsfeeds via RSS - I wake up with a coffee and a blog for breakfast. My final piece of advice would be not to specialise: understand that to be an entrepreneur, you need to wear many, many hats. The good news is that all the different 'hats' you'll need to start your own venture are all interlinked - they all require a mixture of creativity, technical ability, human interaction, and a good dose of passion. Some tasks may only touch one or two of these traits, but often you need to use many on the same day. So don't be afraid to learn new skills - and realise that each new skill is only marginally different from the others in the mixture of those traits. So learn all about design, technology, marketing, usability, finance, psychology - so that when you're start your venture in earnest, you'll have a broad and deep knowledge of, well, everything you'll need! Thanks Andrew for sharing your thoughts with us. All the best for future.